Something wasn’t sitting right in Joan’s life for some time. So when her realtor friend let slip at their son’s wedding reception that husband Robin had put their suburban New York home on the market, she reaches her tipping point. No, she decided, she was not moving with him to Kansas. Much to his dismay, time alone to find herself renting a place in Cape Code was more like it. From the pages of Joan Anderson’s memoir comes this little film written and directed by Alexander Janko. Karen Allen carries the pivot point as Joan, a writer in her 50s who takes this stand in a rustic – read, rickety hand-pump-delivered water to the kitchen sink – house she must reach via rowboat, surrounded by eccentric local folk willing to enter her life with ample opinions, regional support and emotional props of many stripes. Allen’s wonderful as Joan, who is taking it all in with equal parts surprise, horror and then growing fascination and affection. Her sea legs become more and more steady as she learns about them and thus herself. Joan’s main support come from another Joan, an older woman she stumbles upon one foggy morning, a worldly soul eager to share wisdom and spirit and life spark; Cahoon, a handsome clammer and fish store owner who gives her a cashier’s job in the family store and both a calming influence and knowledge that something else could be out there for her if she wants it; and Liz, her book agent back home who wants her get where she wants to go, sure, but keep writing, please and thank you. Celia Emrie glows as the elder Joan, a mentor with a big heart and famous husband living out his final time sadly in a home. Yannick Bisson says solid with every move as the there-for-you handy guy who probably gives too much; and S. Apatha Merkerson, known well on TV back as the steady hand in Law and Order back in the day and again now in Chicago Med gives off a joy as an agent who’s obviously more friend. As for her husband, well, Robin is smart enough to come back east to appear in his wife’s search, even if he doesn’t understand it. Michael Christofer comes across as believable as a guy who’s trying to figure out why and what. My dear wife Karen and I took in a matinée showing at a Cape Cod strip mall cinema complex’s small theater, content among a handful of couples to take in the beautiful scenery in the midst of where the movie was shot. Nice vacation day. We liked the art all around. 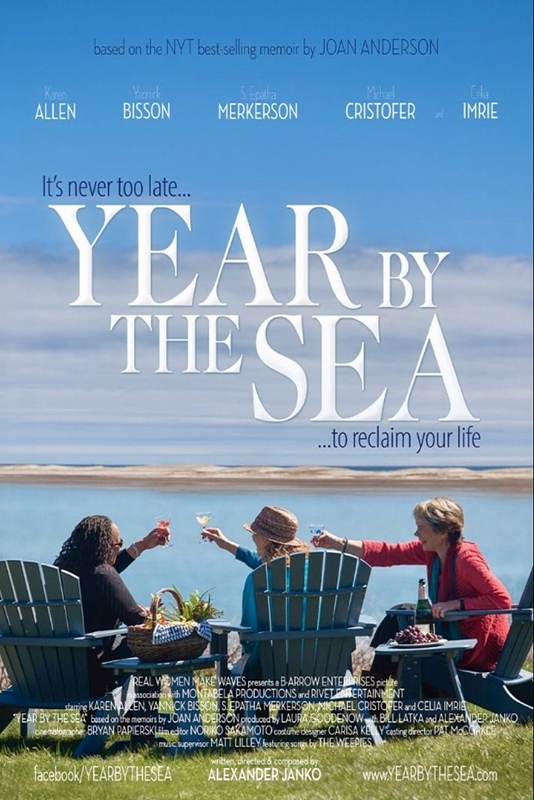 I should see “Year by the Sea,” Mark. Thanks for the review. I think you’d appreciate it, Ann.